When you can't read, listen. 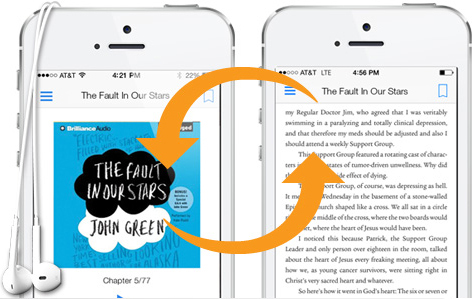 Now you can switch between reading and listening to your Kindle books with the simple tap of a button. Just pop in your headphones, tap the button, and keep the story going...in the car, in the gym, in the kitchen, wherever your day takes you. Whenever your eyes are occupied but your mind is free, your story is ready for listening. Check below for a complete list of supported devices and apps. Read and listen simultaneously with real-time highlighting. It's called Immersion Reading and that's what it does: immerse you in a story by narrating and highlighting the text as you read. It sparks an extra connection that boosts engagement, comprehension, and retention, taking you deeper into the book. *Available on Kindle App for Android and iOS as well as Kindle Fire. Please note Immersion Reading is not available on older Kindle Fire devices (Kindle Fire, Kindle Fire [2nd generation], Kindle Fire HD [2nd generation] or Kindle Fire HD 8.9” [2nd generation]) – Learn more about device compatibility.